Kale is popular. I know so, because I'm seeing it in every magazine I open, on every restaurant menu I scan, and sold out from my local grocery store. Cabbage?! Cabbage is less popular, unless you're eating mayo-filled coleslaw or alongside of corned beef in March. I don't mind the stuff, especially in this (non-mayo) slaw and crazy soup with scotch oats! When I saw the spread on cabbage in October's Better Homes and Gardens issue, I decided to find a few more ways to enjoy the forgotten vegetable. I got so excited that I found myself with not one, but two heads of cabbage in my refrigerator, meaning you can expect a few more cabbage recipes in the weeks to come! Do yourself a favor and grab a head next time you're at the grocery store. It's time for you to get roasting! I've long known that roasting vegetables is the way to go, but never had I though it would transform a lowly cabbage into something so impressive. 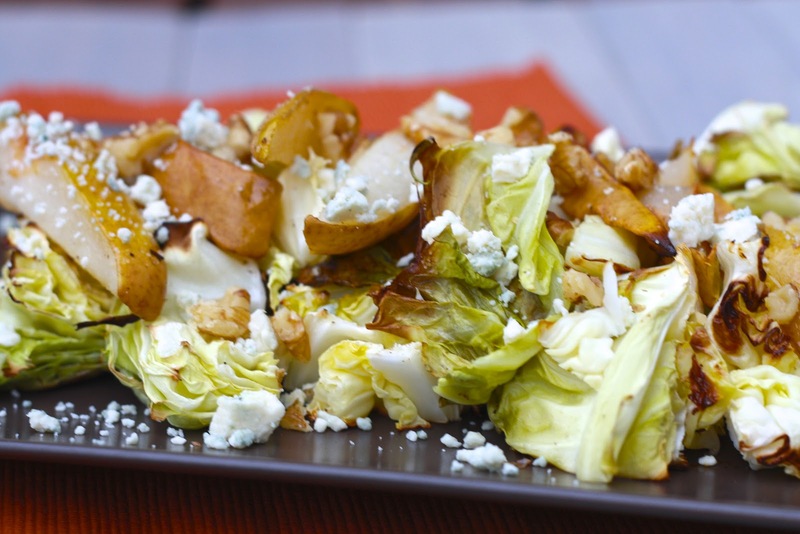 The large wedges of cabbage retain their crispness in the hot oven but take on a smoky flavor as the edges begin to brown. The roasted pears are an ideal accompaniment, sweet and soft. With lemon juice, walnuts, and blue cheese to finish the salad, you'd honestly never guess that it's cabbage you're eating. I will absolutely be adding cabbage to my shopping cart this fall and winter, especially while pears are in season! 1. 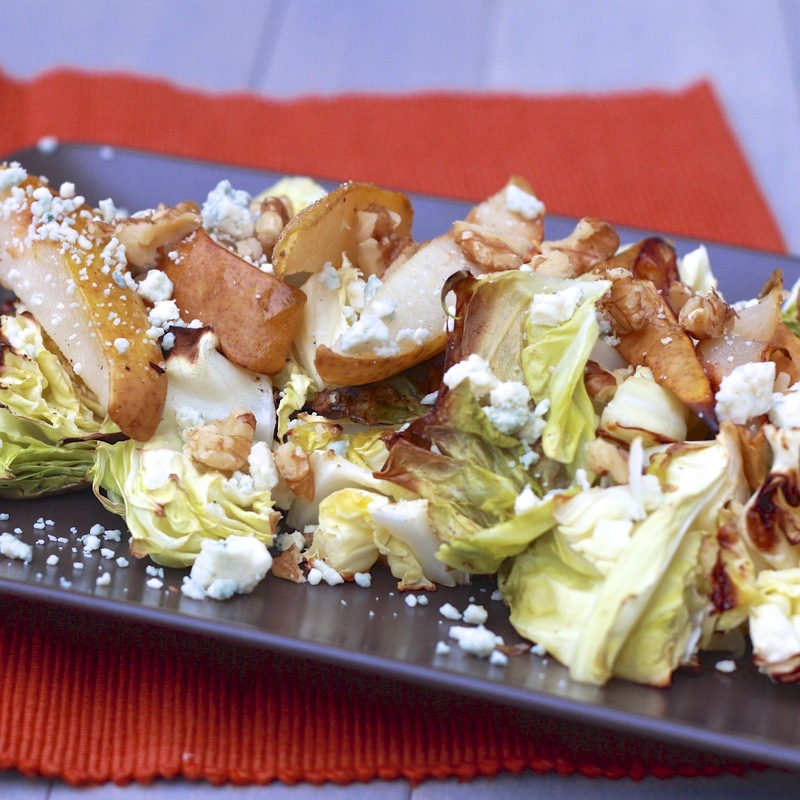 Place cabbage and pears on a baking sheet lined with foil and sprayed with cooking spray. 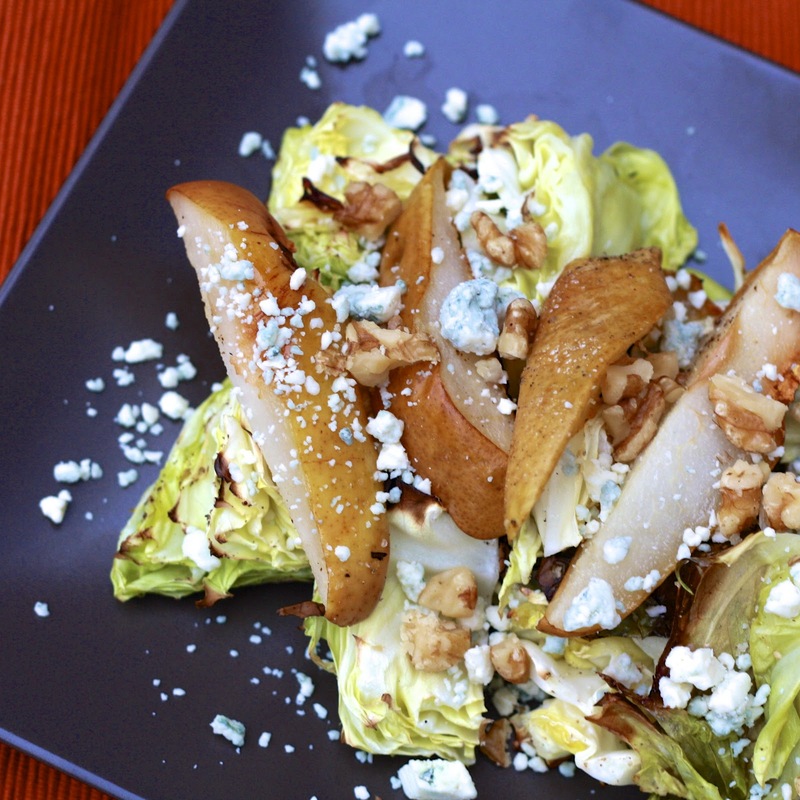 Toss cabbage and pears with olive oil and sprinkle with salt and pepper. 2. Roast at 400F for 40-45 minutes, turning once. 3. Remove from oven and arrange on platter. Sprinkle with walnuts and blue cheese. Squeeze lemon juice over salad.